Abby & Milo: Big Boy Car Seat! We got Milo's big boy car seat today. He's getting so big he's almost ready to transition out of his infant carrier. As with any change that comes along, as my baby grows up, it was a bitter sweet moment. I love that he is so interactive and showing his own little personality but at the same time I miss all the tininess of the newborn days. Every change seems to hammer home the point that Milo's infancy won't last forever so I have to soak up all the cuddles and rocking now before he's too big and mom isn't cool anymore. After doing tons of research, reading many reviews, asking other people who had bought the car seat what they thought then laboring over the decision for months, We decided to go with the Britax Boulevard. 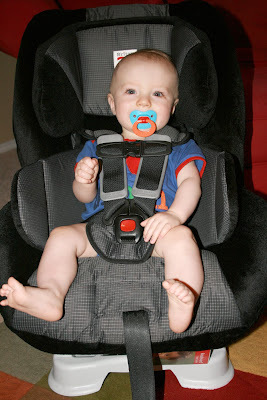 Of all the convertible car seats on the market Britax is rated the safest and of all the Britax car seat models the Boulevard is rated the highest of those. It's that largest of two in the Britax family that features True Side Impact Protection so it can grow with him until he needs a booster seat. The True Side Impact Protection was the thing that sold me and I couldn't find any other car seat that had that. 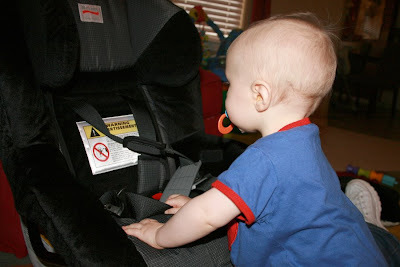 True, all car seats must meet certain standards to be sold in the US but I felt, after all of my research Britax really went above and beyond the standards. 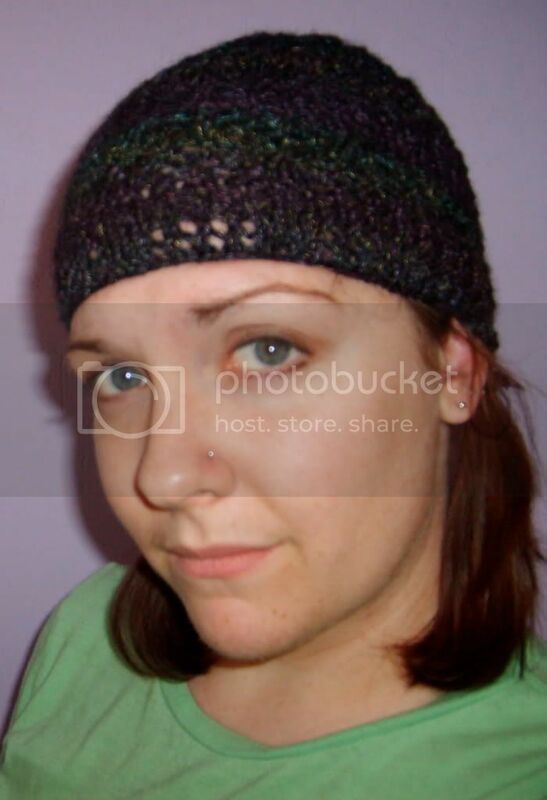 I wish there had been more selection of fabrics to choose from though so we went with the most basic, Onxy. I really loved the Cowmooflauge pattern that comes on the Britax Marathon but I decided that the extra safety measures out weighted my desire to have a cool fabric. After all, as Chris says, it's a car seat not a fashion statement. All in all I am completely satisfied with my purchase and if I had it to do over again I would make the same decision. Milo had a good time flirting with all the girls at the store where we bought it and they had a equally good time passing him around. He let everybody hold him and didn't fuss once. Everybody was impressed with what a cute and easy going baby he is, and as his Mamma, I definitely agree with them! One interesting thing I learned while talking with the sales lady who was installing the seat in my car to see if it would fit was that, in Texas at any rate, it's illegal to NOT have the car seat manual with the car seat at all times and apparently the police do check for this. Who knew? He looks so tiny in such a big car seat. It seems like only yesterday that his infant carrier swallowed him. He gave a good going over after we got it unpacked at home. 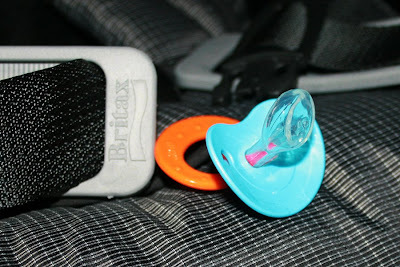 After he got done playing with it he left his paci on it which I took to be the Milo stamp of approval. A big boy carseat - definitely a milestone. I really respect his wanting to inspect it. ;D My kids loved to sit in their seats best when the seats were OUTSIDE of the car. Funny. Very nice -- and the fabric is manly, good to grow with. CONGRATS!! We have a Britax too and love it! He sure is growing up fast A! !